I’m going to miss summertime and all the BBQ’ing that we’ve been doing. Everything from steak to chicken, and veggies and pizza. It’s been going on the grill!! 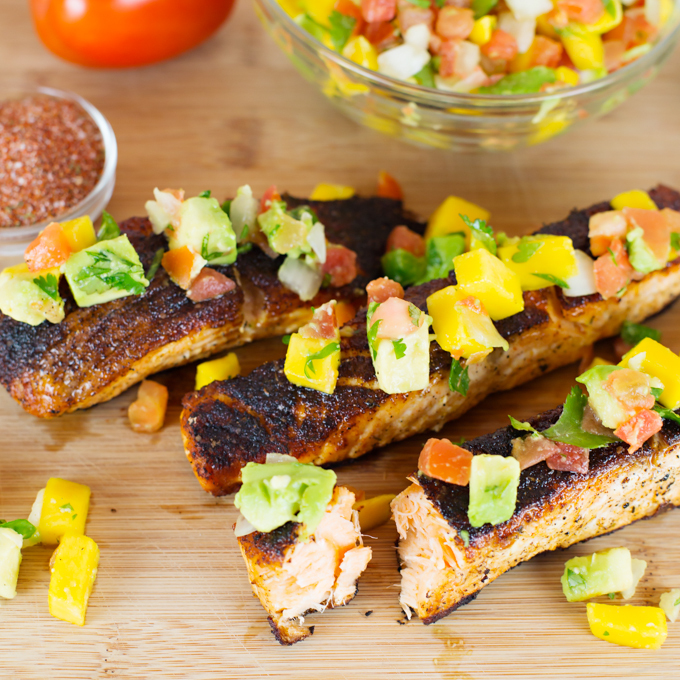 And fish, let’s not forget how often we grill fish. We typically grill salmon, but at the market the other day my husband spotted the swordfish and reminded me how long it’s been since we’ve had it. I agreed and we quickly ordered our two swordfish steaks from the fish market. 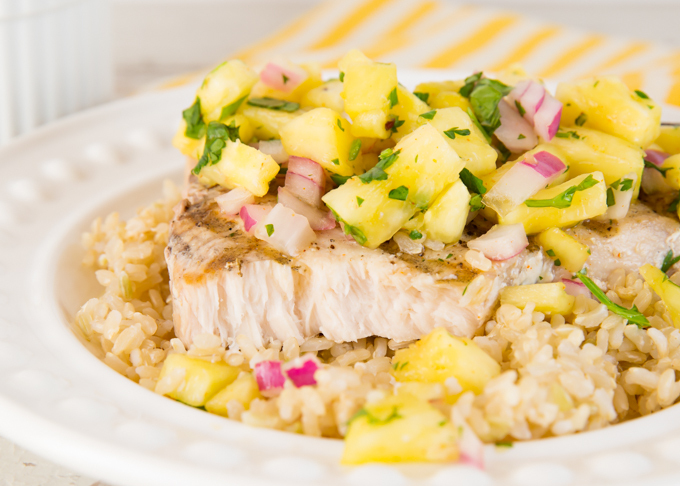 Our dinner of Grilled Swordfish with Pineapple Salsa served over brown rice and a side Caesar Salad was delicious! I hear so many people say they don’t know how to cook fish. It always amazes me, because it’s as easy or easier than anything else. All I did for our swordfish was brush it with a little olive oil and seasoned it with salt & pepper and quickly grilled it. Easy!! 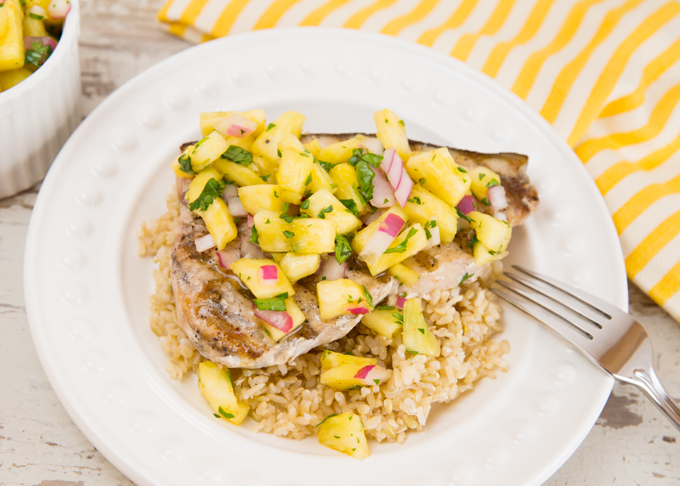 The addition of the fresh pineapple salsa was perfect! 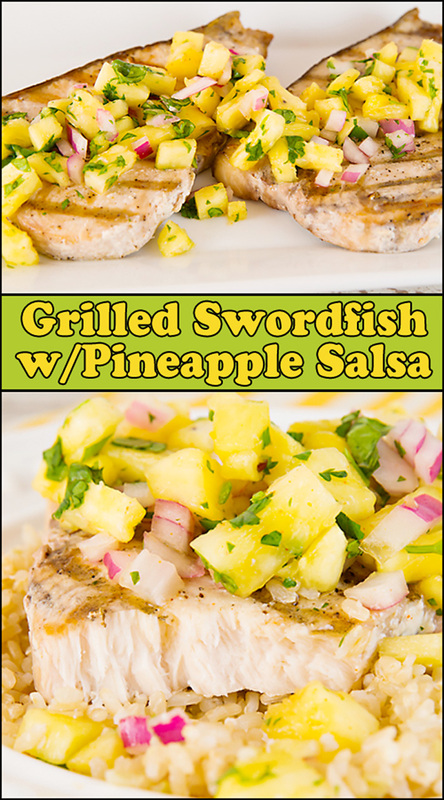 It’s sweet and spicy and the perfect compliment to grilled swordfish!! 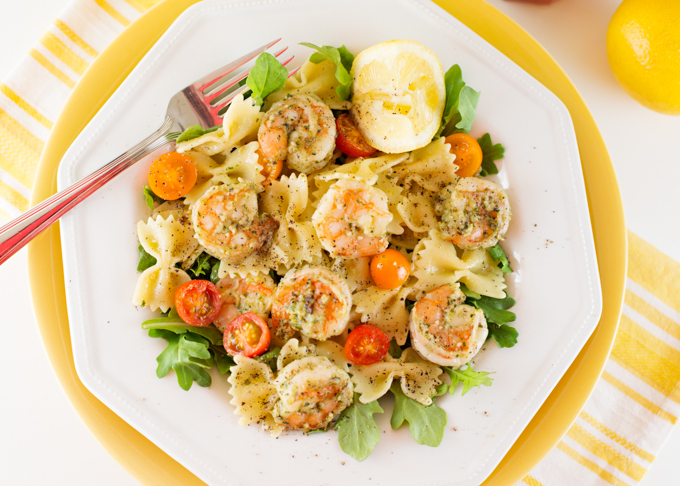 If you love this recipe, don’t forget to PIN it! Preheat BBQ and make sure grill is clean. 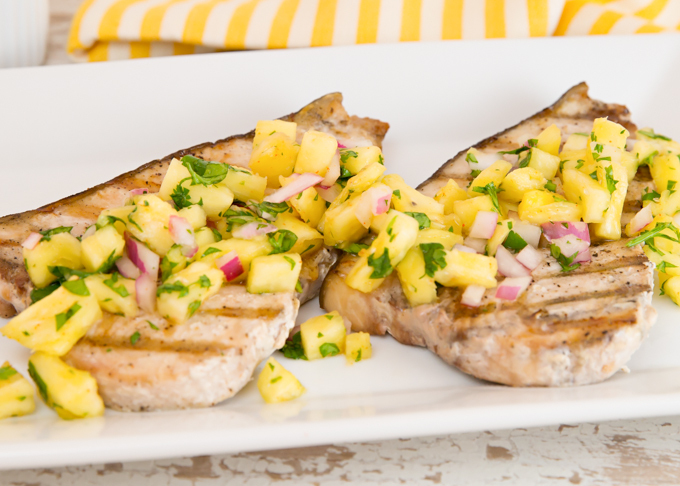 Or you can cook your swordfish indoors on a grill pan. Lightly drizzle swordfish steaks with olive oil and season with salt & pepper. Grill for 8-10 minutes depending on thickness. Peel, core, and chop fresh pineapple. Peel and finely chop ½ of a medium red onion. Rough chop ¼ cup fresh cilantro. Mix together above ingredients. Add 1 TBSP apple cider vinegar, ½ tsp salt, and ¼ tsp cayenne pepper. Mix together and refrigerate for at least one hour. Serve on top of your favorite grilled meat. 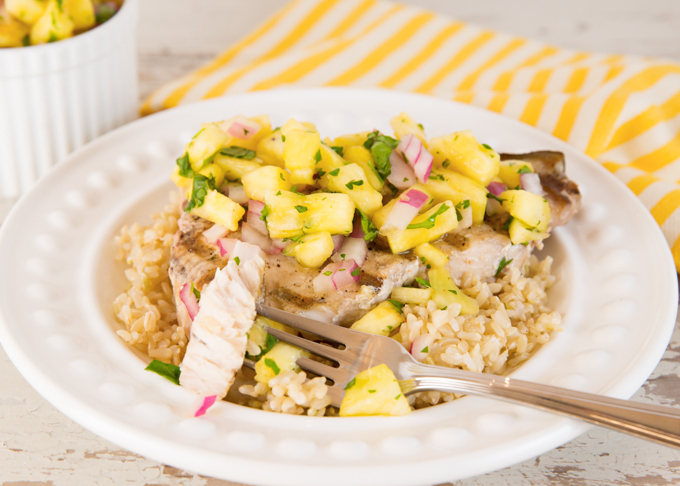 Top grilled swordfish steak with pineapple salsa. Enjoy! 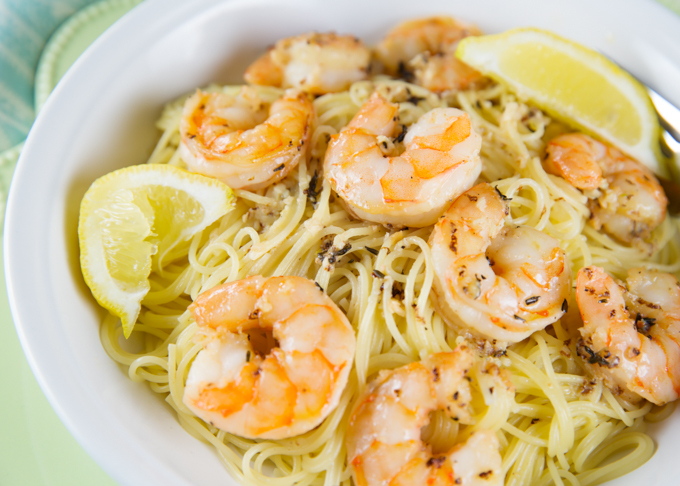 Love how simple and delicious this dish is! Perfect for a busy, summer weeknight. Joy this looks so bright and fresh. I think I will make the fish for my husband and serve the salsa with chicken for me! 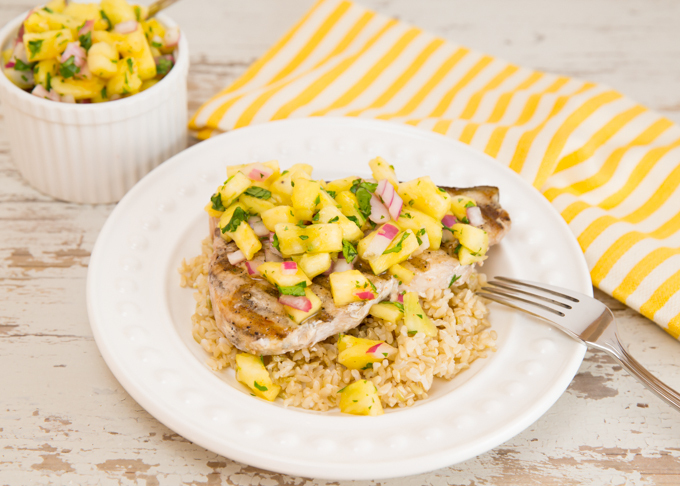 That pineapple salsa looks so fresh and delicious! My mouth is watering right now. This salsa is beautiful and so simple! I like how quick I can make this! Pinned for labor day weekend! Renee, it’s awesome! I cannot wait to try this. I bet it makes the house smell divine and tastes incredible!